Garmin VIRB Elite are action cameras for capturing video during sporting and leisure activities. The VIRB Elite includes a 1.4 inch colour screen and the unit is switched on by using an over-sized button. The VIRB Elite is both Wi-Fi and GPS enabled allowing for wireless control of the unit and measurement of time and distance travelled. There are numerous mounts available for the VIRB Elite so you can mount the camera just about anywhere. You can also record in many different modes with differing screen resolutions and frames per second for differing video image qualities. There is also numerous settings for taking still photos. There is a digital image stabilisation feature for better video recording. You can also adjust for lens distortion. View accessories here. Garmin VIRB Elite has been discontinued. The Garmin VIRB Elite has been replaced by the VIRB X and VIRB XE models. You can however buy genuine accessories for the VIRB here. The Garmin VIRB Elite is an action cameras for capturing up to 3 hours of video and still photos and it has a 1.4 inch Chroma colour screen which uses minimal power. There are multiple mounts suitable for various activities including dash mounts, handlebar, helmet, shoulder, multi-use strap mounts and there are also adapters that allow the use of other industry mounts. The VIRB Elite is also built to be rugged and waterproof to IPX7 standards so you can use it in up to 1 metre depth of water for up to 30 minutes. If you intend to use the Elite for activities that involve water immersion then it is advised that you buy the Dive case which allows you to use in water up to 50 meters in depth. The VIRB Elite is Wi-Fi and GPS enabled. The Wi-Fi enables you to control the VIRB Eite with your iPhone or Android phone using ANT+ wireless connectivity with, for example, the Garmin fenix, Oregon and Edge devices. You can start and stop recording wirelessly and also take still photos without touching the VIRB at all. This is useful during many activities such as when riding a bike, skiing and when you cannot easily manually operate the VIRB Elte. The VIRB Elite also includes GPS technology that enables the unit to record your current location, as well as display and record information such as speed and distance. The GPS will also automatically set the correct time for the unit. Video can be recorded in many different modes including 1080p at 30fps, 960p 48fps, 720p 30/60fps and 848x480 120fps. You can also record in slow motion for up to 120fps. As a guide, you can record up to 3 hours a 1080pixels. Extend the time you can use/record with the VIRB Elite by buying an extra battery. The VIRB Elite can also be used with other devices such as temperature sensor, premium heart rate monitor or accelerometer and altimeter. 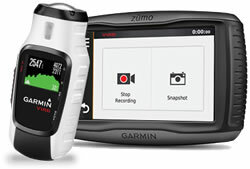 The Garmin VIRB is also compatible with the Garmin zumo 590LM motorcycle sat nav whereby you can control the VIRB Elite via the Garmin zumo 590 5-inch display. ‣Pre-set recording profiles; skiing, etc. ‣Compatible with Temperature sensor, Speed/Cadence bike sensor, Soft Strap Premium Heart Rate Monitor or Accelerometer and altimeter. There are many mounts for the VIRB Elite. For example you can mount the VIRB Elite on the handlebars of your bike, on top of your head, on your shoulder, on a cars dashboard or windscreen and many more places. Looking for accessories to use with the Garmin VIRB Elite handheld device? We sell a vast selection of genuine parts and spares including VIRB Elite carrying case, remote control, large tube bike mount, temperature sensor, premium heart rate monitor and lithium ion battery. Question: I just purchased a garmin virb elite. I am looking to now purchase something it to mount it to- either a shoulder mount or a stick/ tripod. I have no idea if it will fit regular action camera sticks or tripods and was hoping you could help advise me what, if anything, extra I need to buy to make sure it fits. Thanks! Answer: We sell genuine Garmin VIRB Elite accessories. 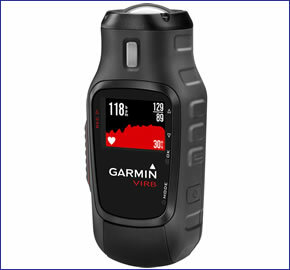 Some parts have been discontinued by Garmin, others are either in stock or low in stock (less than 5). Do you have a question about the Garmin VIRB Elite? Submit your question via our contact page.